This rug is PERFECT in my new black and white farmhouse style kitchen. I get compliments on it all the time. Everyone wants to know where I got it! Get extended use out of this braided rug thanks to its reversible design. 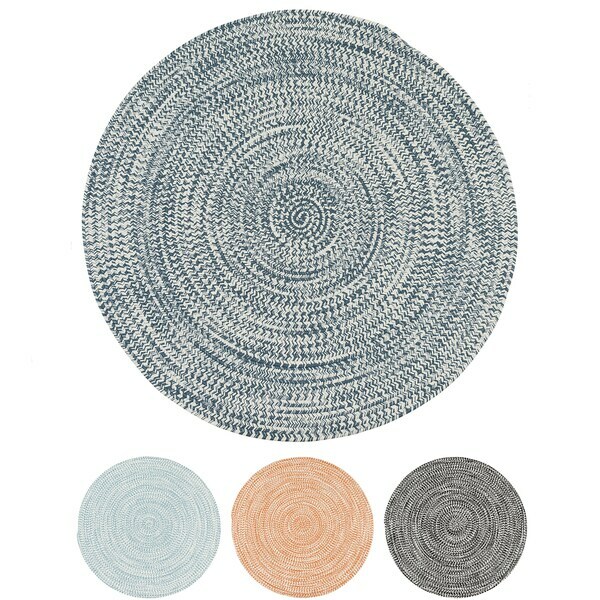 The round, stain-resistant rug features a textured look with blended colors to crate a sense of dimension, and it works indoors or outdoors for versatility. Tip: We recommend the use of anon-skid padto keep the rug in place on smooth surfaces. This is a beautiful rug! I ordered the Atlantic Blue - lovely color, and the rug is so soft! I will be ordering a couple more of these rugs - if you have wood floors, this rug is a must! Absolutely love this rug!!! I had found a picture on Pinterest i wA trying to recreate :) had been searching for weeks for a good priced rug and the right color. Overstock nailed it!!! Shipping was fast and it was beyond perfect for under my kitchen breakfast table. I got this rug in orange. It’s a little more rust colored than I wanted but it does the trick. The quality is good. Perfect color of blue. Works great in the middle of my kitchen! I love this rug! It is exactly what I was wanting for my front entry way. The color was exactly as pictured, is great quality, and seems very durable! This looks great in our foyer as an alternative to an indoor door mat. Very sturdy and perfect for a high use area! I love this rug! I put mine in my kitchen to give the area some "warmth" - it was all tile. Its easy to clean (thank goodness since it is in the kitchen!) Also would be super cute outside on a patio. Beautifully made and looks great in my eat in kitchen. Will probably get the 8' round for another room. I ended up returning this because the sky blue was a little to blue for my kitchen. I didn't even unpack it, but you could see it was a very thick, well made rug. "Is this rug offered in other sizes "
Yes, it does come in a few sizes. If you input Colonial Mills Boatside Multicolor Tweed Round Indoor/Outdoor Reversible Braided Rug into the search bar, it will provide you with all the size options.